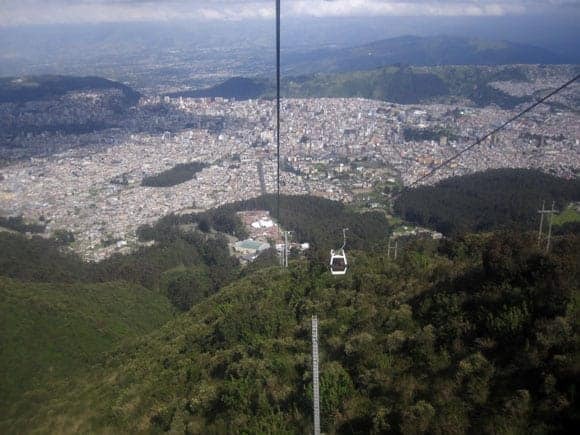 On a recent visit to Quito we took an exciting trip up El TelefériQo. It was a clear day so the view during the ride, and at the top was spectacular! We could see what looked liked the entire city and the surrounding mountains. 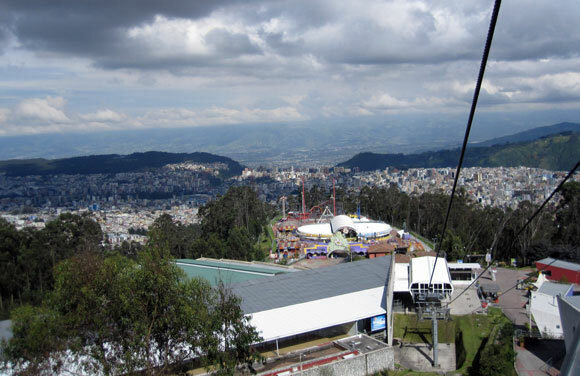 El TelefériQo is very similar to a ski lift, with windows all around and benches to sit on. Each unit is fixed to it’s own specific spot on a very thick metal cord, so you kind of just hang there swaying gently and gliding smoothly to the top. As we progressed up, up, up the mountain we enjoyed ever expanding views of the city, and the surrounding country side. The ride took about 10 minutes. Our daughter was got so excited! She just kept looking all around, pointing and talking about how beautiful everything was. It was also neat to see the cows grazing peacefully as we went by, high above their heads. Drew (our daughter) didn’t seem to think that cows should be up that high on the side of the mountain :). The height at the top is about 4100 meters (13, 450 feet) and because of that it was cold and dizzying. There is a building with some small gift shops and a couple of cafes, it’s also pumped up with extra oxygen to counteract the lack of it due to the altitude. to bring a mountain bike up on the teleferiqo and enjoy a kamikaze ride back down the bike trail to the bottom. Can you guess what we’ll be trying the next time? At the bottom there is a small amusement park, and some places to get snacks and gifts. There are also some very nice looking empty buildings. We aren’t sure but it looked like either we were there in off season, or they were anticipating it to be a much larger tourist attraction than it’s turned out to be. Because it was so close to carnival, we don’t think it was the off season. So if you see some empty building when you arrive, don’t let that stop you, just keep walking up following the signs and you’ll come to it. The ride itself cost $8.50 for adults and $6.50 for children, but we got it for 4.90 adults and $2.50 children. We got the local price because we had our visa identification with us. To get there we caught a taxi from Parque El Ejido for $3. When we were finished the ride, there were vans waiting outside the main area to take us back down into the city. We asked to be taken to Mall de Jardin, and again it was only $3. Would you like to take a ride up the TelefériQo? Have you already done it? Please share your comments on this post. Where can I rent a decent bike in Quito to ride those trails?